What is the name and brand of the paint color. - I must have it! I see "robins egg" in another post, but is that the exact name, and is it Sherwin Williams, Glidden, etc? thank you! Are you operating out of Auckland now? Paint - With which material hace you painted the cabinet doors?? Love this kitchen! I am in the middle of remodeling and need to pick out hardware for my white cabinets. So tired of picking things out! Never thought I would say that! Would you please share the size of the cup pulls, 3 or 4 inches wide? Apron sink - Which brand is it? Thank you. Looks great! What model is it? Where did you find the horizontal plug in's and switches? - You did such a beautiful job on this kitchen, all the details are in order and obviously well thought out. Nicely done! We're in New Zealand and the horizontal options are available here. You must have them too, just ask at an electrical supplier. And thank you for the compliment! Thanks for your quick response! I will check with my supplier. This question was answered previously as "The sink brand is Acquello." You can also purchase farmhouse sinks made in France, such as those by Herbeau. What is the thickness of the granite counter top? Thanks. Thank you! Do you happen to remember the color of the granite? I'm in love with this kitchen! 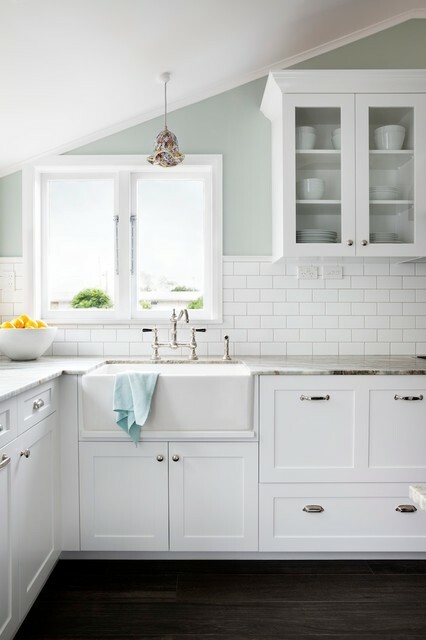 - What color grout did you use with the subway tile? Thank you! hi there! can you share the brand of the grout? What is the pretty paint color on the wall? How do you (if at all) access the space in the corner? - Can you use the space in the corner or is that a dead area? 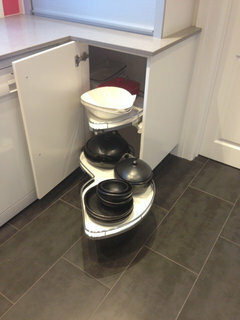 Hi, Cathy - the corner uses a Lemans, which is a special storage solution made by a company called Hafele. You can have your cabinet maker put in this, or any number of different blind corner solutions. Flooring - What is the color? - Absolutely love the flooring. Do you have the color or other specifics of the floor? Wood Tile/Engineering Wood? Faucet - Beautiful work! Can you tell me the brand/model of the faucet? Truly lovely. Thank you! Where did you get the pendant? - Where did you get the pendant? Grout? - Hi- what was the grout color/brand used here? Thanks! Hi, do you by chance know the color of the cabinets, or the undertones - Thanks. beautiful! - did you use a satin finish on the cabinets? Hi! Truly beautiful kitchen. What variety of granite did you use?